Firefighters in Northern Ireland have suspended their unofficial industrial action. They joined an unofficial strike across the UK on Wednesday and were answering only emergency calls. The action was taken in support of colleagues in Greater Manchester who had been suspended because of their refusal to use a new piece of equipment. They said the action was because the employers failed to honour a 3.5% pay deal agreed last November. However, members returned to normal working practices on Thursday evening. A spokesmen for the fire service said they had called off their action to allow negotiations to take place with employers. The news came after fire service employers came up with new proposals to try to resolve the dispute. In a statement, a spokeswoman for the employers said they had unanimously agreed to put proposals to the union in relation to concerns expressed by them over stand-down time. "We believe this form of words will address the need for firefighters to have reasonable rest periods when they are not required by their fire authorities to undertake duties at night," she said. "We are writing to the Fire Brigade Union today detailing our proposed form of words and wish to meet them as soon as possible to finally resolve this one outstanding issue. "After agreement with the union has been reached then the outstanding 3.5%, backdated to November 2003, will be paid to fire fighters." Jim Barbour of the Fire Brigade Union said: "We have been very patient. "We have waited for six months now for the outstanding 3.5% from last November's pay settlement to be paid and we're still waiting. There's a growing sense of frustration. "The unofficial action has simply been suspended." Crews in a number of brigades were only answering 999 calls, in response to the suspension of 19 firefighters in Salford. The firefighters said they had not received an agreed pay rise and refused to use new anti-terror equipment. The dispute quickly spread to parts of Yorkshire, the West Midlands, Wiltshire, Gloucester and Tayside. There was also no fire cover in the Broughton area of Greater Manchester, after crews walked out in protest about the treatment of the Salford crews. Following agreements made in June last year for a staged 16% pay rise, which settled the UK-wide dispute from the previous year, fire crews were expecting to get a rise in November. 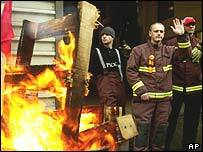 However, the FBU said the pay rise has still not been received and so it had withdrawn from the agreement. Firefighters in Wales last week refused to operate the anti-terrorist equipment, leading to warnings that unofficial action could escalate.